This has probably been the fastest follow-on release I have made across all my projects (still not fast enough), due to an internationalization bug a few users ran into; for any language for which a JSword localization existed, the Bible toolbar / search could produce invalid URLs. I also happened to be working on Map / Image support so that got bundled in too. I managed to throw in a few verse display settings as well, more preferences like this to come in the future. If you already have FireBible installed, simply go to Tools > Add-ons and click Find Updates to find the FireBible update. Or you could head on to FireBible and pick it up. There are no Map or Image modules in the Crosswire repository due to copyright issues, but you can find many in Karl Kleinpaste’s public module repository. FireBible may only display text for a few of these modules due to a bug in JSword which should be fixed in the next JSword release. Watch this space for updates. As always, all feedback appreciated; hope you enjoy this release! It’s been nearly a year since the last FireBible release. Way too long since most of the core functionality for this version was ready way back in July last year. What’s new? 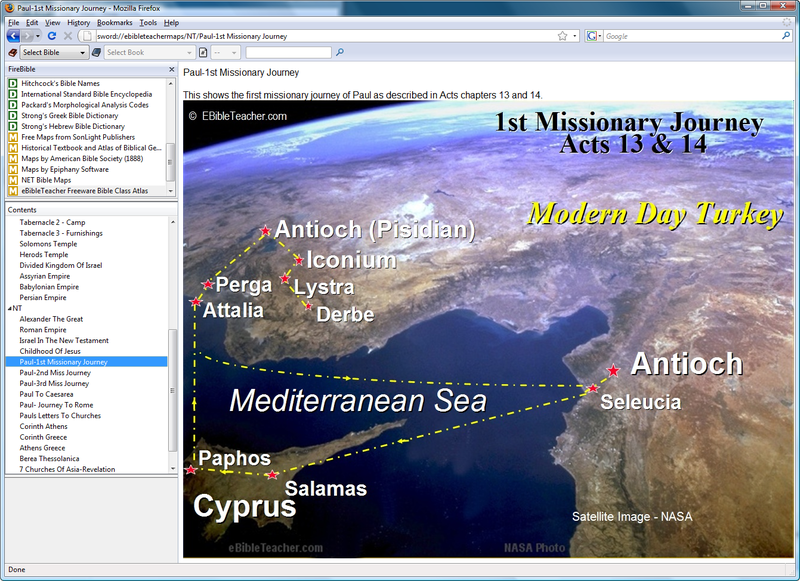 General Book, Daliy Devotional, Glossary and Dictionary support. The awesome bar in Firefox 3 makes looking up content especially easy since all you need to do is type in the title of previously viewed / bookmarked content and Firefox will suggest the best links for you. This version is compatible with JSword 1.6 and the new Java plugins from Sun (see special instructions if you have Java 1.6 update 10 or update 11 installed). For more details, head on to the FireBible page. May take just an hour to get something sorted out technically, but could take a few weeks before you work out all the details and iron out the bugs. It’s been months since the last release and I wanted to let users know that I am still working on FireBible and haven’t abandoned the project. I’m still working out the details, but I think I’m pretty close to a stopping point. 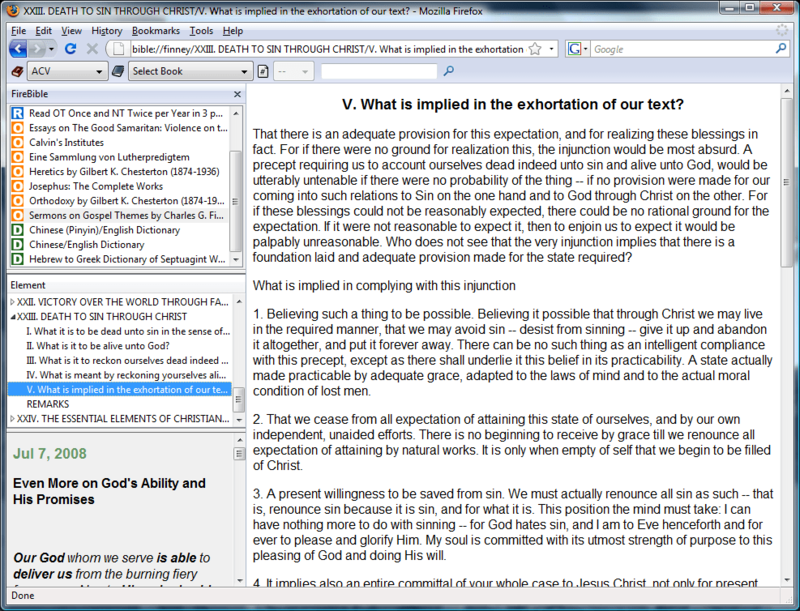 Here is a preview of the upcoming FireBible version, which will add support for General Books, Daily Devotionals, Dictionaries and maybe Commentaries too. This version will also work with the upcoming JSword 1.0.8 release, the existing version will only work with JSword 1.0.7. 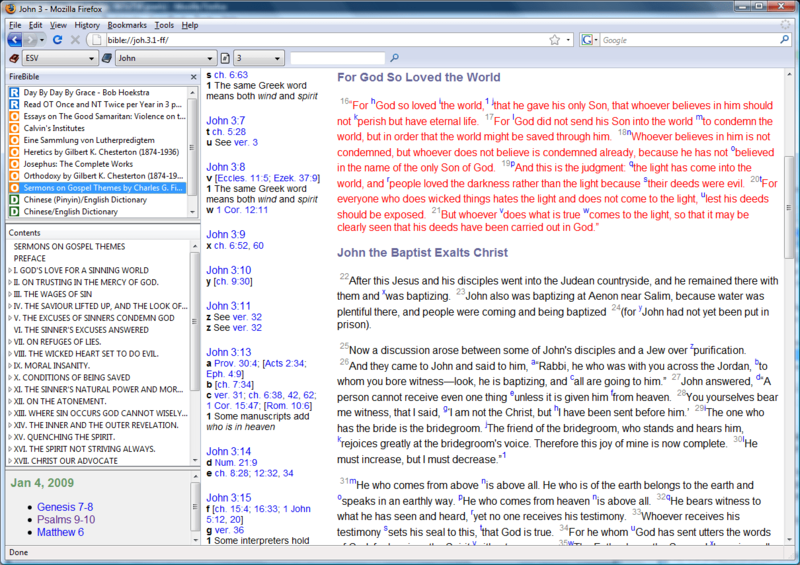 I get a good amount of feedback from fellow Bible software developers on sword/jsword-devel at Crosswire but not much from general users, so if you use FireBible and have some suggestions, I’d love to hear from you. See the About page for contact details.